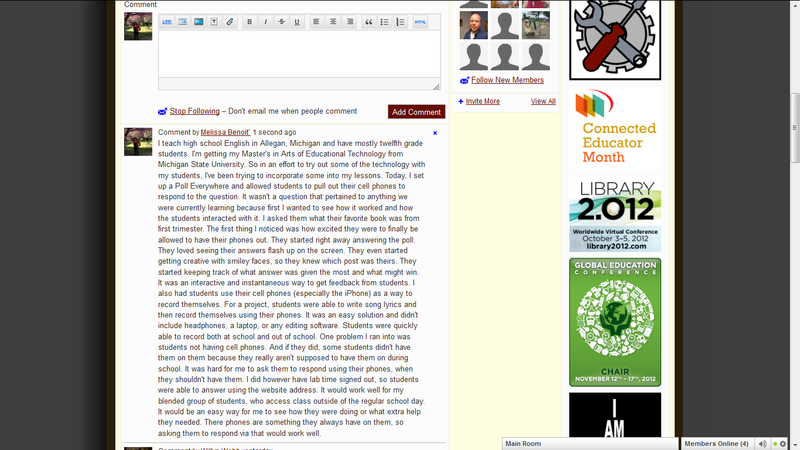 Here is my post on Classroom 2.0 "Cell Phones in Education" post. I wrote about using Poll Everywhere and Iphones in my classroom. I talked about what went well, what was challenging, and what I plan to do with it in the future. Here is the link to my poll and also a screenshot! This is the poll I gave students. This is the Wordle I created to show the results. 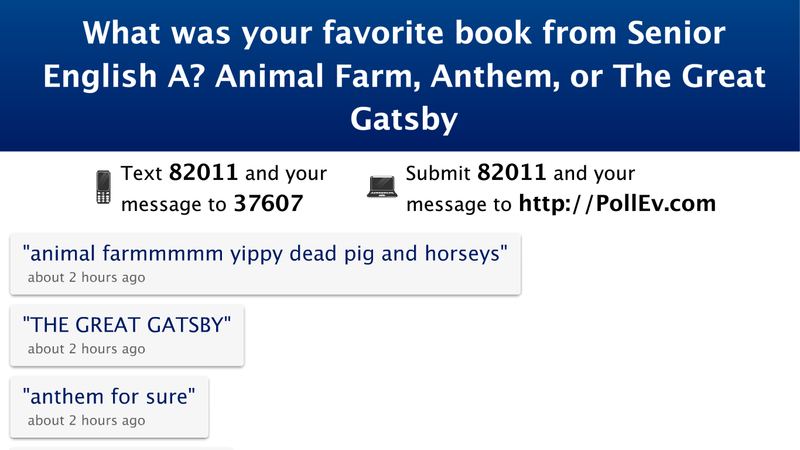 I set up a Poll Everything survey asking my students what their first book was from first trimester. I allowed them to pull out their phones and they could text their results. We were also in the computer lab so students were able to answer that way and then everyone could see their results instantly on the screen. The first thing I noticed was how excited they were to finally be allowed to have their phones out. They started right away answering the poll. They loved seeing their answers flash up on the screen. They even started getting creative with smiley faces, so they knew which post was theirs. They started keeping track of what answer was given the most and what might win. It was an interactive and instantaneous way to get feedback from students. I also had students use their cell phones (especially the iPhone) as a way to record themselves. For a project, students were able to write song lyrics and then record themselves using their phones. It was an easy solution and didn't include headphones, a laptop, or any editing software. Students were quickly able to record both at school and out of school. Using cell phones is a fine line at my school. The policy is that students shouldn't have them during class time. I have been having a hard time keeping them out of the classroom and have decided that for times like these why not embrace them, so kids are actually using their phones to be productive. I really liked Poll Everything. It was easy to use and to set up. I would use it again in any of my classes, granted they could handle using their phones for that moment then putting them away. It would work well for my blended group of students, who access class outside of the regular school day. It would be an easy way for me to see how they were doing or what extra help they needed. I also want to set up Twitter, so they can get homework reminders on their phone. I've also heard of Remind101 that sends a mass text message to students who sign up for it. That would be a great way to get information to students, since they don't always check their email. There phones are something they always have on them, so asking them to respond via that would work well. One problem I ran into was students not having cell phones. And if they did, some students didn't have them on them because they really aren't supposed to have them on during school. It was hard for me to ask them to respond using their phones, when they shouldn't have them. I did have lab time signed out, so students were able to answer using the website address or record their song using Audacity and headphones. So even though mobile technology wasn't a perfect solution, as long as I provide options for students without them, I think it's still a viable use of technology. I know students are constantly texting and on Facebook, which is a huge downfall of mobile technology. It distracts them even more than the normal classroom environment, but I still think we need to embrace mobile technology rather than try and shut it down. Even today, students were way more receptive to class activities after they got to use their phones openly. It became less taboo and was not longer so exciting. I'm open to the idea of using mobile technology more. It allows me to stop monitoring student use of these technologies and instead embrace them and make them relevant to school. Another poll app is Socrative's for iPad/iPhone, androids, and the computer. It has a teacher and a student version and shows up on the device as Student/Teacher Clicker. Personal mobile devices need a set of classroom rules just like any other 'supplies.' Students should know where to store these when not in use and the consequences when the rules are not followed.